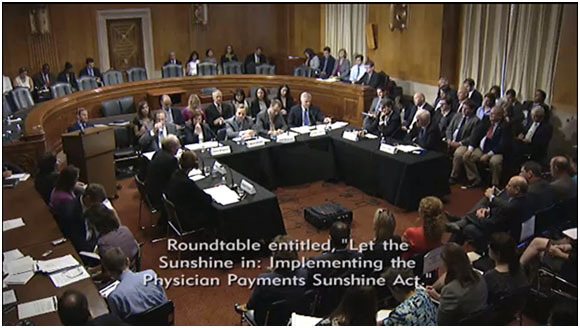 On September 12, 2012, the Senate convened a roundtable entitled “Let the Sunshine in: Implementing the Physician Payments Sunshine Act,” inviting participants from groups with a stake in the implementation of the act, especially the very vocal ones. With the statutory reporting cut off date of March, 2013 looming large, the Senators most responsible for the passage of the act, Senators Kohl and Grassley, wanted to get to the bottom of the key question on everyone’s mind: What’s causing the delay? According to Niall Brennan, Director of the Policy and Data Analysis Group for CMS, the difficulty in finalizing the rules has been the extent to which the proposed regulations received criticism from the stakeholders involved. Which stakeholders don’t want this transparency? Not consumer groups, who uniformly supported the proposed regulations. Not the Association for Medical Ethics, whose members laud full disclosure. The critical stakeholders opposing some parts of the mandate? Pharmaceutical companies, clinical research companies, and some medical associations – in short, those whose financial dealings will inevitably be disclosed under the Sunshine Act and who want certain industry payments to be secret. Which parts of the regulations are they concerned about? The critiques, presented yet again at the latest roundtable, run the gamut from thoughtful and considered to mundane and petty. And while stating unequivocally that they are all in favor of “transparency and disclosure,” it is abundantly clear that they are all in favor of full disclosure only so long as it doesn’t actually apply to them. One bone of contention, for example, is Continuing Medical Education. It’s become a common practice for pharmaceutical and device manufacturing companies to fund or sponsor seminars for doctors to educate them about their various products – so common, in fact, that industry reps and even some physician groups argued that payments from industry to doctors for delivering these seminars should be exempt from disclosure under the Sunshine Act. The theory, apparently, is that CME will suffer because doctors will be less willing to speak at seminars promoting products if they know that the amount of compensation they are receiving will be publicly disclosed. At least, that is the theory that the President of the AMA and the drug companies are presenting to CMS. What they aren’t saying is undoubtedly what they really fear: doctors will be less likely to be persuaded by their colleagues’ glowing presentations about Drug X when they find out exactly how much those colleagues are being paid for their presentations. The AMA's position is that only CMEs “certified” as being unbiased – though completely industry funded – should not have to reveal payments. It is contradictory to say "unbiased" and "industry funded" seminars in the same sentence. Companies do not fund seminars to “educate” doctors on options other than their products! It should be crystal clear the AMA is thus under industry pressure – and they are yielding. While everyone agrees that it is very important for doctors to stay abreast of new developments in their fields and to continue to the enhance their education and knowledge on an ongoing basis, not everyone agrees that it is appropriate for seminars sponsored or funded by industry to be considered a part of that ongoing education. Dr. James Scully, president of the American Psychiatric Association agreed, noting that the APA had fazed industry funding out of their CME programs beginning in 2008. According to Dr. Scully, the APA supports and appreciates drug marketing in a big way, but recognizes that it just isn’t education. Candidly, he admits that public pressure and the appearance of impropriety inherent in the industry-sponsored seminars caused the group to make the change. The Sunshine Act doesn’t prohibit drug company sponsored seminars, or even seek to regulate them in any way. Congress so far has been perfectly content to let the medical community deal with these educational/marketing promotion cross-overs in any way that they see fit. All the Sunshine Act will do is bring those activities out into the daylight, so that doctors and patients can see exactly who is being paid to say what. If these disclosures are so strongly opposed by medical companies and compensated “consultants,” what does that say about their actual intentions in the field of healthcare?